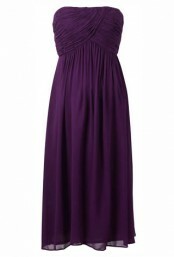 Crave Maternity dress hire and a great Giveaway! If you follow my blog you will know that i am a big fan of Crave maternity. Well i am even more so now after the recent launch of their maternity party dress hire! This is such a fabulous idea and just in time for the party season, i wish such a service existed when i was still pregnant! What a great offer and perfect for tempting you into purchasing some gorgeous and stylish new maternity clothes from Crave Maternity. I especially love their collection of maternity trousers and suits to help cut a yummy mummy look in the office! Their swimwear is great too for flattering maternity cossies and tankini's. Baby Harper Beckham is always dressed fabulously, which is no surprise seeing as her mum is one of the most influential celebrities in the fashion world! She looks super stylish pictured here in an Autumnal brown checked dress with matching brown tights. You can also dress your baby girl in some great little outfits inspired by Harper. I had a quick look in Zara and there are some fabulous baby dresses that really reminded me of this one she is pictured wearing. Steal Amanda Holden's style in a sequin gold maternity dress, with your very own sparkly number from Isabella Oliver. Gold and shimmery with a flattering grossgrain tie that flatters your curves, you are sure to turn heads for all the right reasons! If you want the same look but are not bold enough for gold, why not wear a similar black version from Mothercare!? There very own shimmering maternity shift dress from Blooming Marvellous would look just as stunning. Two maternity Christmas party looks, it's as easy as that. You can find both dresses in my shopping page!